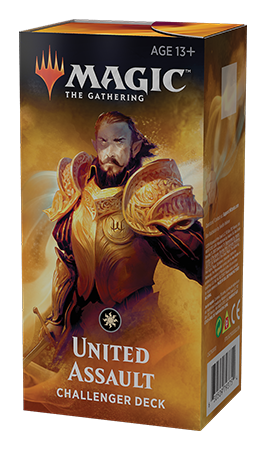 Challenger Decks will be available April 12, 2019, and will have an MSRP of $29.99 (only applies to the United States). These decks will be available worldwide in English, with Japanese available in Japan. Hey y'all, I'm Donald, the lead designer for this year's Challenger Decks. You might know me from registering Wily Goblin at the World Championships in 2017 or, perhaps, leading the last year of Challenger Deck design alongside Allen Wu. I'm here to give a little background and behind-the-scenes insight on the decks we've designed for this year. I want to give a shout out to Michael Majors and the whole Play Design team for giving feedback and building these decks with me. One of the biggest reasons for the success of last year's Challenger Decks is that they were authentic. Those decklists were modeled after lists that placed highly in premiere tournaments at the time, and my goal was to recreate that authenticity with this round of Challenger Decks as well. However, there was a unique challenge presented by Ravnica Allegiance. These decks were designed around the time of Pro Tour Guilds of Ravnica, so we wouldn't know exactly how Ravnica Allegiance would shake up the format. Even without considering all the powerful cards Ravnica Allegiance has introduced into Standard, the "shock lands" (Blood Crypt, Breeding Pool, Godless Shrine, Hallowed Fountain, and Stomping Ground) would open up countless three-color combinations for Standard! Actually, there are only ten three-color combinations, but, regardless, we decided to stick to guilds and known decks from Guilds of Ravnica. These decks are meant to be competitive out of the box, so the risk of guessing on a guild or three-color combination that Ravnica Allegiance enabled was too high. Something as simple as misjudging the optimal curve and playing too many three-drops could cause a deck to not function. Now let's break down each decklist! There were a lot of different options when we were building "United Assault," the mono-white deck. The Pro Tour Guilds of Ravnica featured the full spread of one-mana white creatures: Snubhorn Sentry, Leonin Vanguard, Skymarcher Aspirant, Hunted Witness, Dauntless Bodyguard, Healer's Hawk, and Rustwing Falcon (aka Trusty Rusty). As the metagame evolved after the tournament, we also saw these numbers change. Notably, Hunted Witness and Snubhorn Sentry set a precedent over Rustwing Falcon as Deafening Clarion became a staple of control decks and Goblin Chainwhirler became less played. We decided to model "United Assault" off Luis Scott-Vargas's 2nd-place deck from Pro Tour Guilds of Ravnica because it minimized the amount of guesswork we had to do in terms of the metagame at the decks' release. Luis Scott-Vargas's build was the most self-contained and cohesive build of White Weenie and the least sensitive to metagame pressures. If you're looking to modify the deck, Tithe Taker and Unbreakable Formation from Ravnica Allegiance have been doing great work to fight against control decks! Ajani, Adversary of Tyrants and Venerated Loxodon have been popular options for White Weenie decks, and I encourage you to try different configurations of one-drops, such as more Hunted Witness, Snubhorn Sentry, or Rustwing Falcon if you're running into Goblin Chainwhirlers. Adding either blue or red as a secondary color is also a viable option. Blue gives access to Deputy of Detention and counter spells for more interaction, and red lets you play Heroic Reinforcements for explosive attacks. "Lightning Aggro," the mono-red deck, was much more stable and predictable to build than "United Assault" if only looking at the Guilds of Ravnica metagame. However, we knew that the powerful spectacle cards and the new guilds would make an impact to the archetype. To avoid misjudging the optimal configuration of spells (which people are still debating) and potentially ruining the deck, we decided to stick to the tried-and-true Wizard's Lightning and Runaway Steam-Kin plus Experimental Frenzy packages. If you're looking to try out different cards for this burn deck, I recommend Light up the Stage, Skewer the Critics, and Risk Factor first and foremost. Then you can explore adding green or black to the deck. Alex Majlaton's deck from Mythic Championship I is a good place to start if you want to add green for cards like Cindervines and Collision // Colossus. If you're more of a Rakdos Guildmage like myself, I suggest trying Rix Maadi Reveler, Theater of Horrors, Carnival // Carnage, or, my favorite mirror breaker, Sovereign's Bite. 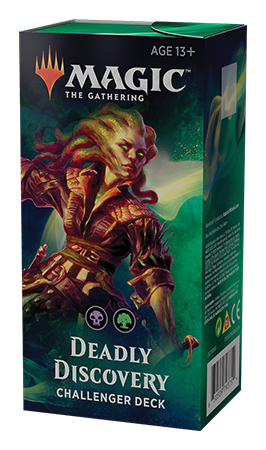 "Deadly Discovery," the black-green deck, was another tricky deck to build as there was no consensus on what cards were best at each spot on the curve and public opinion was shifting each week. Much like the mono-white Challenger Deck, we went with the self-contained explore package—Wildgrowth Walker and their friends, Merfolk Branchwalker, Seekers' Squire, and Jadelight Ranger. Outside of that, we looked to showcase the different options the deck has. This is the most open-ended deck in terms of how you can modify it. Some of these midrange decks lean heavily into planeswalkers with Karn, Scion of Urza; Vraska, Golgari Queen; and Vivien Reid. Some try to play more ramp creatures like Druid of the Cowl or Incubation Druid and maximize Carnage Tyrant and Doom Whisperer. Midnight Reaper occasionally shows up in all versions of this archetype. Hydroid Krasis and Hostage Taker have convinced many players to splash blue in the deck, which also opens up the ability to play counterspells in the sideboard. There is also an undergrowth build of this deck that takes advantage of Molderhulk (which pairs perfectly with Memorial to Folly) and Izoni, Thousand-Eyed. 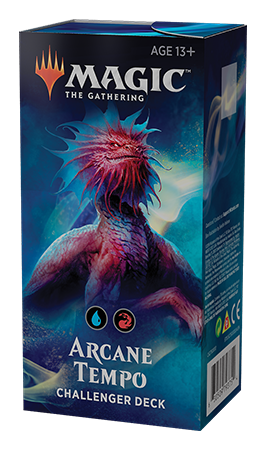 "Arcane Tempo," the blue-red Challenger Deck, is yet another deck that was going through lots of fluctuations as the metagame evolved. 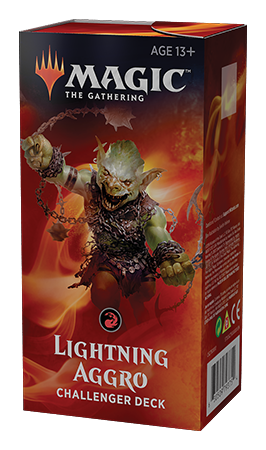 The number of Goblin Electromancers constantly changes, Enigma Drake and Crackling Drake are either played in tandem or one over the other, and cards like Murmuring Mystic, Niv-Mizzet, Parun, and The Mirari Conjecture occasionally appear. We decided to go with a much more controlling build with main deck Niv-Mizzet, Parun and Murmuring Mystic for archetype diversity between the Challenger Decks. Much of our inspiration came from Pascal Vieren's Izzet Drakes deck with which he went 9-1 at Pro Tour Guilds of Ravnica. If you're interested in being more aggressive and playing a tempo strategy, you can consider adding Pteramander, Enigma Drake, and Spell Pierce. I also recommend Andrew Jessup's 1st-place deck from the StarCityGames.com Invitational in December and Luis Scott-Vargas's deck from the Top 8 of Mythic Championship I as inspirations to edit your decklist. This archetype is very open-ended! I knew these Challenger Decks would be much more difficult to work on this time around, but I love how they turned out. I'd love to hear what y'all think about this round of Challenger Decks, so please reach out to me on Twitter. How do you feel about these Challenger Decks? As a member of Play Design, I would also love to hear what y'all think about Standard and our Limited formats as a whole!